Motorhomes are the perfect option for living comfortably while seeing the beautiful country side. All of our coaches are built on a heavy duty truck chassis, giving you the secure and safe feeling on the road. When the wind is blowing at your side door, you won't feel a thing. Everyone loves the comforts of home, so why not take them with you? All coaches are custom built to suit your needs, taste and budget! 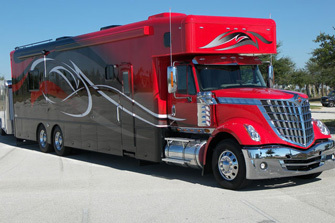 Why buy a ShowHauler from Swan Creek? Because they will last you longer, are less expensive that the big name bus coaches and more importantly... the customer service will never leave you stranded!